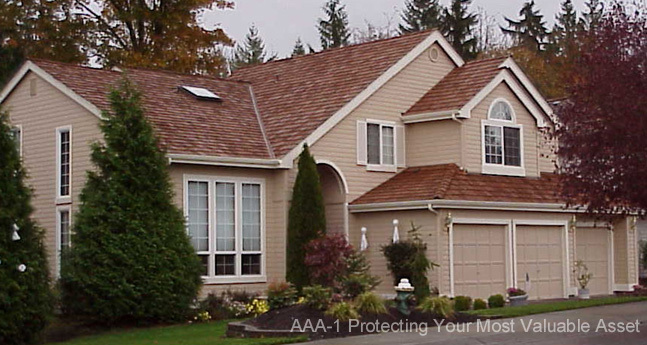 AAA-1 Pressure Washing Services Company is proud to offer the homeowner a comprehensive line of home maintenance, preventive maintenance and home improvement services. Preventive maintenance for your most valuable asset using the most reliable source and the best materials and workmanship available today. Please don't wait too long to fix problems that may develop into major repairs. Detailed information for new roofing when you have exhausted all opportunities for repair. Air cleaning offers an alternative cleaning method for debris removal and Armor-Tec protection. Let us clean your driveways, walks, and decks to set off your beautiful home. We can make repairs and blend old with new roofing while saving you money. As a last resort, when there is no other alternative, you can select us to replace that aging roof with confidence. We offer the best quality workmanship and materials at the best prices in the Northwest! Get your free estimate and compare today!